Get started making your own jewelry right away! We furnish all the instructions, beads, and supplies you will need to create your own masterpiece! These creative kits make perfect projects for rainy days and bring the whole family together! They are also great for retreats and bead classes! Purchase several kits and share your love of beading with a close friend or family member. All bracelet kits are adjustable to make the size you need. Click on a picture or link for more details and to enlarge. Free shipping is available! Looking for Holiday Ornament Creative Bead Kits? Just Click Here! Most kits will need Cutting, Round Nose, Chain Nose, & Crimping Pliers. If you are having trouble deciding which kit to start with just try one of our Bead Clubs! We pick out the kits and you get new kits every month! Our Most Popular Club!!! Each month we will send you a complete set of creative kits in the Mail! You will get a bracelet, necklace, and earring kit. Each Creative Kit Set comes complete with instructions and beads. These kits are a lot of fun to make!!! Join anytime and cancel anytime. Each month we will send you one Necklace or Bracelet Creative Kit in the Mail! Each Creative Kit comes complete with instructions and beads. This club is really a great value and gives you something to look forward to in the mail each month! Join anytime and cancel anytime. Each month we will send you 3 Different Earring Creative Kits in the Mail! Each Creative Kit Set comes complete with instructions and beads. This is our newest club and every month you get 3 exciting projects!!! That is something to really look forward to!!! Join anytime and cancel anytime. 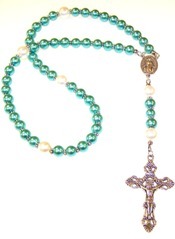 You can make your own rosary using our Rosary Kits. The kits come with instructions, beads, and supplies! Just click on any of the links below to view more information.